For a one-of-a-kind, stylish driving experience, look no further than the 2017 FIAT 500X. 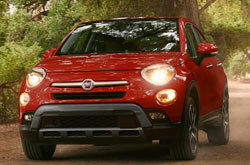 The 500X has the distinct FIAT styling in a crossover SUV package. For the new model year, the trims of the 500X have been slimed down to three choices, each with extensive lists of standard features. 2017 FIAT 500X reviews note that this model is one of FIAT's best offerings, with versatility and excellent driving capability, but with distinct Italian flair and attitude. Learn more about what this stylish SUV has to offer in our review. The 2017 FIAT 500X in Scottsdale is a subcompact SUV that offers five-passenger seating and comes in three trims. At the base level is the Pop. Standard features for this trim include an information screen, adjustable front seats, heated mirrors, USB and AUX ports, and a four-speaker audio system. The Popular Equipment package is an option for the Pop. This adds safety tech, a touchscreen display, Bluetooth connectivity, satellite radio and an upgraded speaker system. The Trekking trim gets many of the features from the Pop and Popular Equipment package. It also adds on rear privacy glass, an upgraded display, upgraded upholstery and adjustable drive modes. The Trekking gets its own Popular Equipment package that includes roof rails, ambient interior lighting, a power-adjustable driver seat and dual-zone climate control. There is also the Cold Weather package that adds heated seats and steering wheel. A navigation system can also be added on the Trekking. At the top-level is the Lounge trim. This model includes all of the features from the Trekking and its feature packages plus an auto-dimming rearview mirror, an upgraded sound system and a rear cargo cover. There are a couple of feature packages that can be added to both the Trekking and the Lounge trims. The Advanced Safety package adds safety tech, automatic high-beam control and automatic wipers. 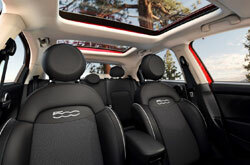 With the premium package, you get a dual-pane sunroof and a premium Beats audio system. 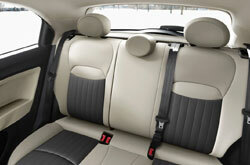 Leather upholstery is also an available standalone feature. 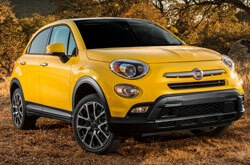 Two engine options are available for the 2017 FIAT 500X in Scottsdale. The Pop comes standard with a turbocharged 1.4-L four-cylinder that produces 160 hp and 184 lb.-ft. of torque. It is also standard with a six-speed manual transmission and front-wheel drive. A 2.4-L four-cylinder engine is standard on the Trekking and Lounge, and is optional on the Pop. This engine generates 180 hp and 175 lb.-ft. of torque. It is also standard with a nine-speed automatic transmission and front-wheel drive, though all-wheel drive is also an available option. 2017 FIAT 500X reviews enjoy the pep and nimble handling of each of the models. The FIAT 500X is outfitted with several standard safety features, and have several options for more advanced safety tech. Standard features include traction/stability control, antilock brakes, hill start assist and active front head restraints. Additional features include a rearview camera, parking sensors, blind-spot monitoring, lane departure warning and forward collision warning with automatic emergency braking. 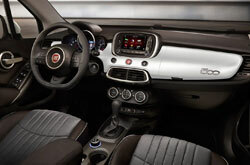 Why Select the Fiat 500X? If you live in the Phoenix area and have been considering a new car like the 2017 Kia Soul, Honda HR-V and the Nissan Juke, we propose you take a prolonged look at the 2017 Fiat 500X. Due to its cabin amenities, finely crafted looks and enchanting personality, it could be just the vehicle for you. 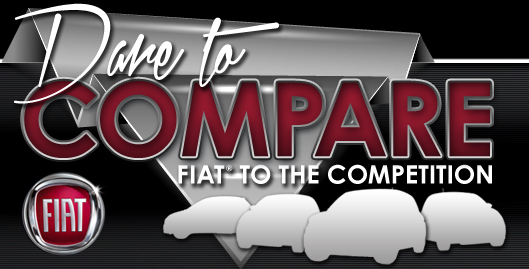 Now that you're nearly through with our 2017 Fiat 500X review page, make sure to check out finance incentives offered at FIAT of Scottsdale! For new and late-model-year used cars, choose us to find a marvelous selection, which includes the fashionable Fiat 500X. We hope our extensive 2017 Fiat 500X review helped you find the details you need to make a confident buying decision. 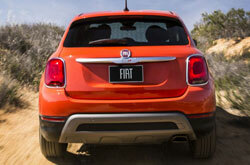 Stop by to be smitten with a test drive at FIAT of Scottsdale, where you can examine the Fiat 500X upfront. Also, before your visit, you can see its chic exterior design from all ends by viewing our video.